How to Throw an English Picnic Camping Party! Wait, what kind of party theme is that?! A great one, actually. Most often I start with a food or drink and build my party theme up from there. This one started with Scotch eggs, which are one of Will’s favorite foods, but not something we come across often. For those unfamiliar with this delightful food, it is a hard boiled egg, completely encased in sausage, coated in bread crumbs, and deep fried. So not something to be consumed often, but that is nearly impossible in these parts anyways. In the last couple years we’ve only been able to find them from Myers of Keswick in NYC, and when we were in Ireland. Scotch egg’s unfortunate rarity and Will’s love for them made for a perfect birthday centerpiece. I was already coordinating some of his friends to meet us for a camping trip, so a picnic theme was perfect for a party without a kitchen. Plus it was wildly different than the Mexican meal we had 2 years ago, and last year’s Southern rib party (it is way too soon for repeats). I pulled Jamie Oliver’s Great Britain off the shelf and got to planning. Rainbow salad with carrots, beets, cabbage, apple, and parsley. I couldn’t find any English style sausage like bangers for the Scotch eggs, so I bought some ground pork and improvised a bit. I referenced this banger recipe, subbing pork meat, leaving out the added fat and beer (because I didn’t have fat and wanted a firm sausage since it wouldn’t be in a casing), and then loosely followed the rest of the recipe based on what spices I had around. Not exactly traditional, but I think I ended up with a better outcome than if I had gone with a readily available but imperfect substitute. The actual Scotch egg process was surprisingly easy….minus peeling the eggs. I should have listened to Kenji and put the cold eggs into the hot water. Once that frustrating bit was over, I proceeded with my sausage through Jamie’s recipe and coated the eggs with flour, then sausage, then flour again, eggs, and bread crumbs. I heated oil in a smaller Dutch oven so I could use less oil but still have a deep pan, and fried them in batches of 2-3. With the oil at 300F, they took exactly 4 minutes as specified. With so much effort invested in a single appetizer, the accompaniments had to be easy. Classic cheeses, and pickles to cut the richness from everything else rounded it out. The sandwiches were all about the brisket cooked low and slow in a Worcestershire broth the night before. It was literally as easy as throwing everything in the same pot and then not forgetting to take it off the stove before bed. I reheated the brisket in the broth over the fire, then shredded the meat. Then to serve you just throw together a simple cucumber salad with red onion and white wine vinegar, heat the bread, and put out with butter and mustard. The salad was a perfect showcase for summer vegetables. I prepped everything but the apples (which I subbed for the pears) beforehand, and made the dressing in a jar to go. My one regret was that I made exactly the amount of dressing called for, and thought the salad could have used a little more. The cookies may not have been English…but I wanted something easy to transport and they were delicious. This is assuming you have a party on a Saturday night (or have time to prep a day before). It could all be done in the same day if needed. If you’re truly having a picnic, you could put the salads together before leaving, and only assemble the sandwiches on site. I’m the boss at Thanksgiving this year. As always, with such power comes responsibility. There is a menu to plan, shopping list to make, tasks to dole out, and the added complication of not cooking in my kitchen, so I have to make sure any needed equipment makes the trip as well. This isn’t my first Thanksgiving rodeo though, so fear not. My menu so far is easily executable versions of classics. Though what I consider classics may be debated. I to this day have never consumed green bean casserole. I have only once attended a Thanksgiving where marshmallows were allowed on top of sweet potatoes (it was with an ex-boyfriend’s family – maybe a sign that it wouldn’t last?). To me, marshmallows on sweet potatoes are as outlandish as capers on ice cream. 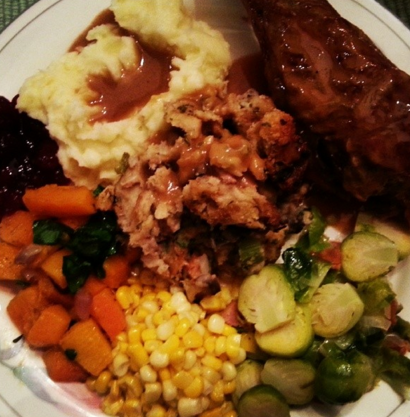 Mashed potatoes are a given, perhaps something with sweet potato or a squash, and the green things vary. I think I recall sautéed green beans on the table growing up, but I can’t say that for sure. I’ve tried out Brussels sprouts the last few years which I love, but they aren’t appreciated by all. This year I’m going to use Thanksgiving: How To Cook It Well as my guide, but wanted to offer up a few options I’ve made before to fill out your menu. The turkey. Every time I’ve been in charge of the turkey, I’ve made Alton Brown’s and it had not failed me. Brining makes for a moist bird, and his hands off approach is so logical – why would you keep opening the oven to baste when that lets all the heat out? Thought maybe it just appeals to me because I don’t want to be tending to the bird anyways. There is also a recipe for brined turkey in Thanksgiving that I may try out. Stuffing (or dressing, if we are being technical). I’m most undecided about stuffing. This kale and caramelized onion stuffing looks so good, but I’m not sure it would be a crowd-pleaser. I may have to save that for anther time. I’ve made cornbread stuffing and more traditional bread and celery stuffing, but I can’t say any recipe stood out enough for repeating. Suggestions? Mashed potatoes. I think this is the only Pioneer Woman recipe I’ve ever cooked. You would be creamy too if you had this much cream cheese, cream, and butter in you. Sweet potatoes or squash. Chipotle smashed sweet potatoes are a bit of a departure from normal fare, but are a welcome spicy/sweet combination. Green things. I’m deciding between these Dijon braised sprouts (which I like a whole lot) and the creamed ones with bacon in Thanksgiving. I may lean towards the creamed ones to make one more attempt at converting Brussels sprout haters, who are often swayed by cream and bacon. And I supposed I should offer a non-sprout green…maybe green beans? Gravy. Yes, another Alton recipe (for big holidays, I tend to rely on my dependable favorites). Cranberry sauce. I like my cranberry sauce in a blob rather than a cylinder. This recipe makes for the perfect complement to all Thanksgiving fixings, only has 4 ingredients, and can be made ahead. You can go even simpler as all you need to make cranberry sauce is cranberries, sugar/honey, and water, or fancier with the addition of liqueur or nuts. Extras. This fresh cranberry cocktail is tart and festive. It takes a bit of premonition, but serving is easy. I’m not a huge pie fan, and the marbled pumpkin gingersnap tart with cheesecake swirls is just the perfect thickness and amount of pumpkin. Even more ideas. I made a Pinterest board a few years back to keep track of Thanksgiving ideas. Last year the New York Times posted Thanksgiving Recipes Across the United States. Some suggestions are very questionable, but they are fun to read through. And lastly, Thanksgiving can be an expensive meal not in reach for everyone. Many food banks and pantries are accepting donations right now for their Thanksgiving distribution. Here is a great list of foods to donate now and all year long. After the usual reluctance I’ve started to accept fall. It’s not a season I dislike, but letting go of summer is always hard (have I mentioned I like eggplant and tomatoes?). But I also want to embrace the here and now, so we decided to throw an Oktoberfest party (and there is nary a nightshade on this menu). Besides sending out an invite, collecting firewood, and making mustard, the prep happened the day of. All the food was made beforehand and put out so guests could eat as they arrived and sampled beer. The only thing I made before the day of was the mustard which I started on Tuesday (soaking the seeds) and then finished Wednesday. The party started at 7, so I shopped in the morning and got home around noon. 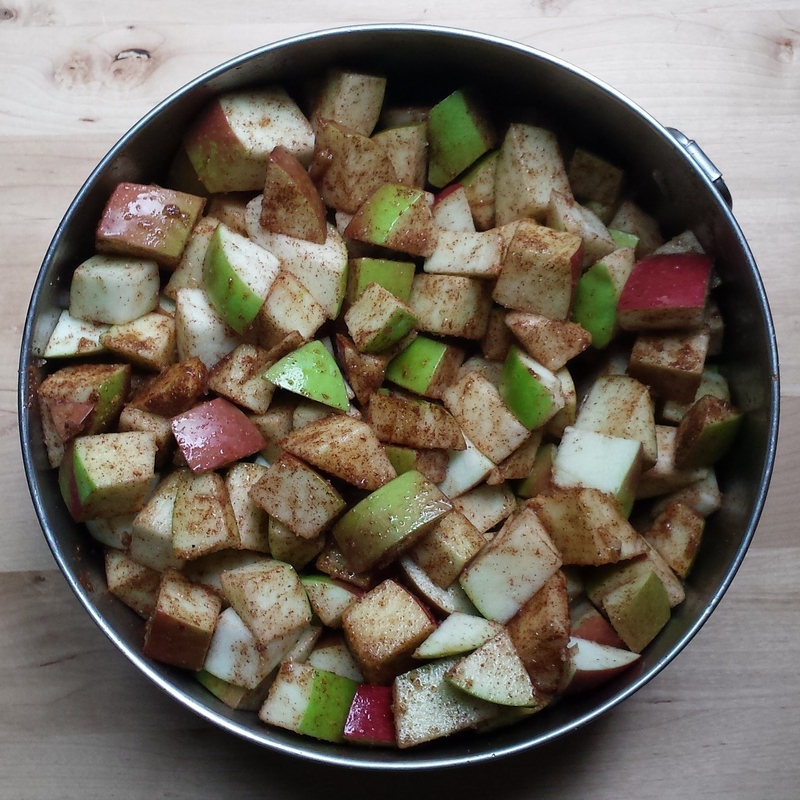 First order of business was the apple cake, which needs 90 minutes in the oven. Then I made the potato salad, followed by the pretzel dough so it could rise. I puttered around setting some things up, sliced cabbage for the slaw, then rolled out the pretzels, boiled the water and preheated the oven. The pretzels were then boiled, painted with egg, and salted. Once the pretzels were in the oven, I put the sausage in baking sheets and punctured holes for the fat to drain out. After the pretzels came out of the oven I turned it up a bit and put the brats in to cook for about 30 minutes (remove them when they are a little brown on top). While the sausages cooked I made the hot slaw. I just set out all the food so people could graze, but this could be a sit down dinner as well. 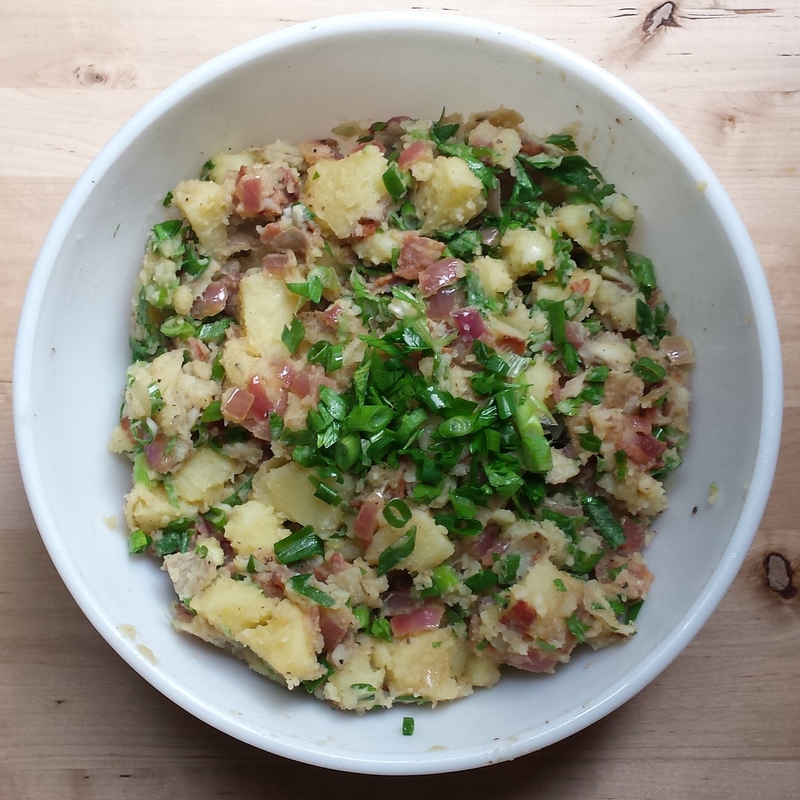 The flavor of the German potato salad was great. I overcooked my potatoes a bit so they were not the cleanest chunks, but the party did not seem affected by it. 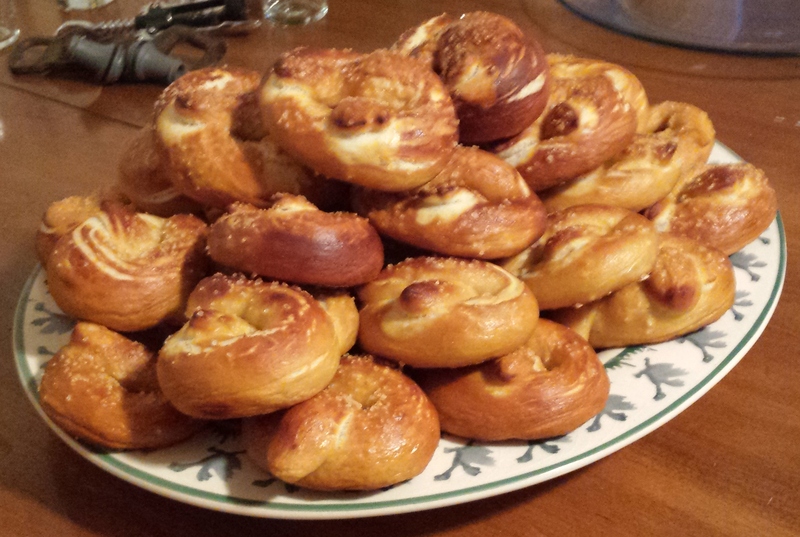 I doubled the pretzel recipe and made half-sized pretzels, so I had 32 total. I was expecting about 15 people, and wanted everyone to be able to have 2 (there ended up being a few leftover, maybe 10). The dough rose just as it was supposed to, and was super easy to work with while rolling them out. I didn’t have pretzel salt (because I didn’t buy any….) and just used coarse salt which was a little intense. This is seriously spicy mustard. I halved it because 5 cups of mustard seemed like a whole lot and it was a smart move. I am a spicy mustard lover, and just a tiny dollop of this is fine for me. The brats were pretty hands off as I just stuck them in the oven. If I had a grill I may have used that, but the oven was already on and I needed to be in the kitchen so roasting was plenty easy. A chicken and apple sausage would be a good option if you don’t want all pork. I also read up on traditional Oktoberfest foods and considered roasting a chicken as well, but I’m glad I didn’t because that would have been so much meat. Good alternative for next time. I wavered about putting the bacon in this but eventually decided to go with it (not my most vegetal of meals…). Caraway is a spice I disliked violently upon my first taste, but recently I’ve tried to be more accepting of. I used just a tiny pinch and felt very open and accomplished. In the end I thought this was very appropriate, and I really liked it paired with the potato salad, brats, and a little extra mustard. This apple cake is so moist and great for a crowd. I have never bothered peeling the apples, used apple cider instead of orange juice and substituted just a bit of the white flour for wheat. It is a heavy cake, and took more like 105 minutes to bake for me. I left the beer selection up to Will who picked a variety of German and American made märzens. German breweries we were able to find were Ayinger, Erdinger, and Weinstephaner, and then American Oktoberfests came from Sierra Nevada and Switchback. Guests brought lots of other options like Sam Adams, Blue Moon, Brooklyn Brewery and a few we already had. And one person brought a bottle of champagne that we didn’t see until everyone left…off theme, but always acceptable. We set out tasting glasses and left bottles open on the counter so someone could just sample a beer or take a whole one. If I hosted this as a dinner party I might make it a more formal tasting with rating sheets and everything, but I liked this system with more people. It was really fun to host a party outside of the times I feel like everyone is having something (don’t expect a Halloween or Christmas party here) with a good theme. I can see this becoming an annual occurrence. Excluding the year that I make it out to Munich, of course.